I just went through a very harrowing legal situation with a customer who purchased a Sefer Torah through my store. B"H, emes won out - but the legal fees and other procedural costs are crushingly hard to bear. It seems, though, from talking to other brokers of Torah scrolls, particularly used scrolls, that many people are on pins an needles after the recent scandal regarding Holocaust era and "rescued" European scrolls. Does anyone else have this sensation? 1) In the sales contract, it must state that "kosher" is not the same as "immaculate physical condition." It sounds obvious to we soferim, but many people who do not know better cannot make this subtle distinction and assume that "kosher" means pristine and like-new condition. 2) /I will never again agree to give every single detail of the repairs to customers. I emailed daily logs of everything done to the sefer as per the customer's request. They absolutely freaked out at every single email - eventually they were convinced that the Torah must be riddled with problems and was somehow "defective." 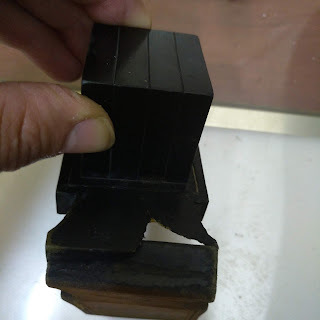 The issues I repaired were very small things: little tears in the margins, resewed some seams, replaced reinforcing matleisim, and cleaned several smudges. Oddly, a result of providing them with so much detail, is that they became convinced that I was hiding details! 3) I have a clause in the contract which states that any "opinions as to the origin or age of this scroll are given in good faith and to the best of the Sofer's knowledge, yet are not a guarantee as to the origin or age of this scroll; other experts may disagree with the Sofer's opinions." In the future, I will add something that binds the buyer to acknowledge that the validity of the purchase is not predicated on the exact origin or age of a scroll. 4) I will add also that, once the customer sells or transacts the Torah to another entity, or once they have allowed another sofer to perform repairs or replace eitzim, that my initial warranties as to kashrus, condition, etc. are no longer valid. If another sofer decides to tinker with my work, I will not take responsibilities for his mistakes. Does anyone else have any practical advice to safeguard oneself? I realize that most of us are probably not attorneys, but I am looking to share insights and idea, if anyone has some to offer. I pasken on stam for around 20 years. There are many tikunim which I tell the magiya/sofer "you may not tell this to the client" !!! People at large don't appreciate the hard work of a sofer/magiya, and at the other hand will quickly machmir on any little tikun that occurred, deciding it is bdieved - causing financial loss and great ogmas nefesh, and loss to the cheftzei kedusha themselves. And many times (as I witnessed) also the clients personal loss, and later great ogmas nefesh. The notes above By R. Bloomenstiel & David are correct and noteworthy for all mis'askim b'stam. Also beware of some socharim !!!! A Maaseh: One of the local rabbonim brought by my store a travelling Israeli sochar. This fellow had impressed the Rabbi with a bunch of letters of recommendation from R'Ovadia Yosef, Rav Auerbach, and a whole bunch of Roshei Yeshiva and other gadolim. He then pulled out "kosher lechatchila" Beis Yosef Mezuzos that were missing the kotz d'rabbeinu tam and with round-top beis throughout! 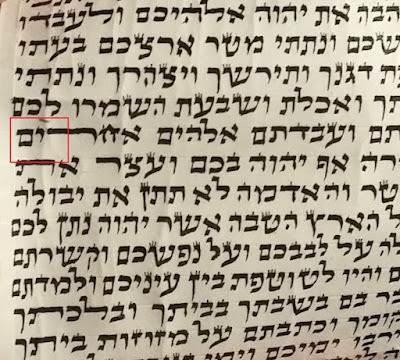 I pointed out these problems, at which he got very defensive and just kept repeating loudly that the soferim that write for him were mumchim and yorei shomayim. I replied that this may be true, but their "mehudar" mezuzos definitely are not "yorei shomayim!" He then showed me the "basic" mezuzos, which were a serious shandeh! 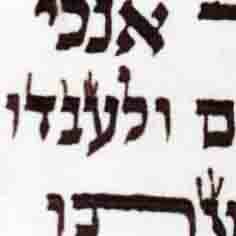 He also had sefardi mezuzos that were beautifully written- but on mashuach klaf! The Rabbi who brought him to me got involved and said "Why are you giving this sochair such a hard time? He has sold hundred of mezuzos to the other stores in town and none of them have given him a hard time! In fact, he went out of his way to bring you his best schoira because he knows you are a sofer!" On the one hand to say less is better sometimes, Olam golam, and if you rattle off to much you may scare or confuse the wits out of your customer, and they may think you are a drey kop. On the other hand, often, the situation demands that you say it as it is. I weigh up each case and rely on my judgement as to what is called for in this situation. I also don't think it is necessary to say anything if the situation has been rectified or can be easily rectified without much fuss or expense. I am an attorney (as well as a sofer) hence the original screen name so i will avoid putting out my opinion in public. All I can say is that for a contract of sale dealing with an item that is worth upwards of $50,000 or more (not to mention taking months or more of a person's time) it would be advisable that the contracts you use are looked over by an attorney admitted in the state/country you are in. If the Sofer writes in the sale contract that all legal disputes must only be mediated in a Beis din (and not a secular court), is this legally binding, thus preventing the possibility to take this dispute to court? A long time ago, I composed a contract (in Hebrew) for writing a new sefer Torah. I appreciate this site so much - All that I learned in my 18 years experience is published here. And Rabbi Bloomensteils "A Maaseh:" unfortunately this is maasim bechol yom.